"The light (ner) of G-d is the soul of man. "[i] The word ner is commonly translated as "candle" or "lamp." Accordingly, many people think that this proverb teaches us that "The candle of G-d is the soul of man." But this does not fit the proverb's meaning. The proper definition of ner, as it is used here, is really "light." It is the light of G-d that is the soul of man, not the candle of G-d. The candle of G-d is man's body, not his soul. King Solomon wrote these words to give us an excellent description of the human condition. Each of us is likened to a candle that has somehow been placed here in this world. The candle represents our physicality, our individual bodies. Each candle is single and unique. But the candle is just wax and wick, nothing more. It cannot light its own light because it does not have any fire to light it with. The light has to be brought to it from somewhere else. 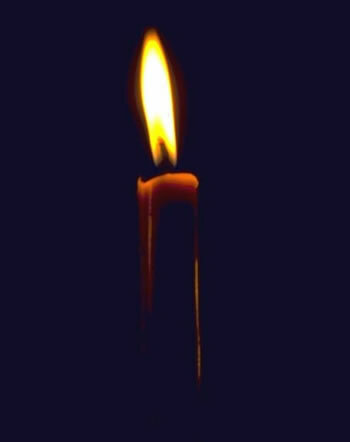 Once the candle is lit, we say that the candle is giving us light, but this is not true. The candle is not giving us the light, the candle is merely housing the light. Once the candle is lit, wherever it goes, the light will go with it. This is true until the fire consumes the candle. When the candle's wax and wick are burned up, the light also goes. After the candle is gone there is not even the faintest trace of it ever having been here. That is, unless it used its flame to light another candle. If it did, and if that other candle went on to share its flame with other candles, then the first candle is remembered even long after it is gone. Each night of Chanukah we light an additional candle, but still, there is only one light in the room. The light shining in the room is always just a single light. As we add more candles this light merely gets brighter and brighter. Although there are many candles, many flames, many wicks, there is always only a single light. Here, we are using the light to stand for the spiritual essence, the life of each of us that is always one. The candles stand for our individual bodies, our uniqueness. This is the multiple perspective. Although our bodies are many, our lives are one. Although the candles and flames are many, there light is one. Although the material perspective shows us that there are many, the underlying spiritual perspective shows us that the many are also a single one. When gazing at the Chanukah candles, we can see that the flame has more than one color in its middle and lower area, but only one color in its upper area. When we look at the physical perspective, we are focusing on the many. When we look at the upper perspective, we see that there is only one. Both are true. Here we are using the flame to stand for the physical reality. Its lower aspect is multiple, while its underlying upper aspect is singular. Now, go on to see that the area just above the upper tip of the flame is brighter than the many colors in the flame. It is even brighter than the single color that is located in the upper end of the flame. It is brighter than the rest of the areas that surround the sides of the flame. Look above the top tip of the flame to the bright glow that closely surrounds it. This glow is much brighter than the flame itself. Yet, it is beyond the flame. This brightness is seen in the area just above the physical flame. This brightness hints to the spiritual essence that all of us really long to experience. It is the brightest. It is clear and formless. It is beyond even the highest tip of the flame, even beyond the physical light. Although it is bright it cannot be called light. It is beyond the light. It is clarity. The lower, physical perspective is multiple and beautiful. The upper perspective focuses on the underlying single Entity that all existence really is. The clear brightness above the tip of the flame hints to the spiritual essence that our souls yearn to reveal. Searching for and finding this brightness is an exercise that can move you from the grosser, lower, multiple perspective (the many colors) to the underlying singular nature of existence (the higher singular color or area of the flame) and then train you to go up even higher than the singular perspective, onto the spiritual essence of all existence. All existence, although multiple is also one. Both of these perspectives are true. By studying the flame we can train ourselves to search for the underlying One. By focusing on the bright clarity that is beyond the flame we can train our minds to reach for the underlying spiritual essence. The entire material creation is multiple, singular and spiritual. Each definition applies to a different perspective of the same one. Once these spiritual truths are realized and taken to heart one's behavior toward one's fellow must reflect this higher understanding.